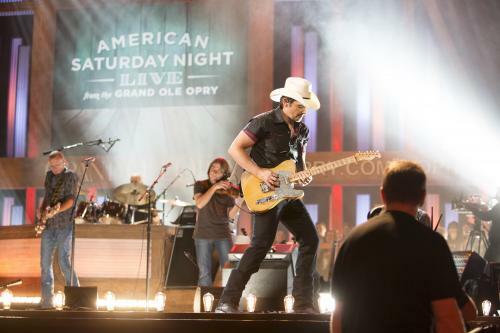 Nashville- (October 1, 2015) — The show that made country music famous is set to take some of the genre’s most popular artists to the big screen in December when its first feature film, American Saturday Night: Live From The Grand Ole Opry, previews in theaters across America. The made-for-cinema concert film captures on-stage Opry performances and backstage moments with Opry members Brad Paisley, Blake Shelton, and Darius Rucker, as well as country favorites The Band Perry and Brett Eldredge. American Saturday Night: Live From The Grand Ole Opry is set for a limited special engagement at select Carmike Cinemas in the US beginning December 4. Distribution across America will follow in January in partnership between the Opry and independent distributor DigiNext, a joint-venture of Carmike Cinemas Inc. (NASDAQ: CKEC), a leading motion picture, alternative programming and 3-D motion picture exhibitor. American Saturday Night: Live From The Grand Ole Opry is directed by George J. Flanigen IV. Executive Producers are Steve Buchanan, Robert Deaton, Pete Fisher, and Flanigen. To find theaters, show times and purchase advance tickets, visit www.oprymovie.com. Tickets also available throughwww.fandango.com and www.MovieTickets.com. The Opry is set to celebrate its landmark 90th birthday this weekend (October 2 – 3) in Nashville, Tennessee. Country superstars Little Big Town and Carrie Underwood are among those scheduled for weekend performances, while shows later this month will feature Miranda Lambert, Alan Jackson, Alison Krauss, Loretta Lynn, and The Charlie Daniels Band, among others. About DigiNext, LLC: The future of film distribution, DigiNext has developed a comprehensive worldwide, direct-to-consumer (DtoC) movie release platform. The platform showcases the talents of today’s most talented and passionate directors and producers of independent features as well as issue-based documentaries, providing them with a unique and customized way to drive additional value and recognition of their work. DigiNext offers filmmakers a domestic theatrical release, plus a global, targeted reach to worldwide audiences. Brands and marketers can also access pre-selected targeted audiences via DigiNext’s end-to-end platform. DigiNext is a joint venture partnership between Carmike Cinemas (NASDAQ: CKEC), the nation’s fourth largest theatrical exhibitor - with approximately 2900 screens across 41 states - and Nehst Out, creator of a content distribution system reaching 70+ countries via electronic sell-through including digital downstream, DVD and other ancillary revenue opportunities. About Carmike Cinemas: Carmike Cinemas, Inc. is a U.S. leader in alternative programming, digital cinema, 3-D cinema deployments and one of the nation's largest motion picture exhibitors. Carmike has 270 theatres with 2,882 screens in 41 states. The circuit includes 48 premium large format (PLF) auditoriums featuring state-of-the-art technology and luxurious seating, including 30 "BigDs," 16 IMAX auditoriums and two MuviXL screens. As "America's Hometown Theatre Chain" Carmike's primary focus is mid-sized communities. Visit www.carmike.com for exact show-times and to purchase tickets. About the Grand Ole Opry: The Grand Ole Opry® is country music’s most famous show and presents the best in the genre live every week from Nashville, Tenn. Celebrating nine decades of entertainment, the Opry can be heard at opry.com and wsmonline.com, Opry and WSM mobile apps, SiriusXM Satellite Radio, and its flagship home, 650 AM-WSM. The Grand Ole Opry is owned by Ryman Hospitality Properties (NYSE: RHP). For more information, visit opry.com. Images are provided gratis for journalistic use for one year from date of release in conjunction with coverage pertaining to the event of the photo. All other uses require express written permission from Grand Ole Opry, LLC.